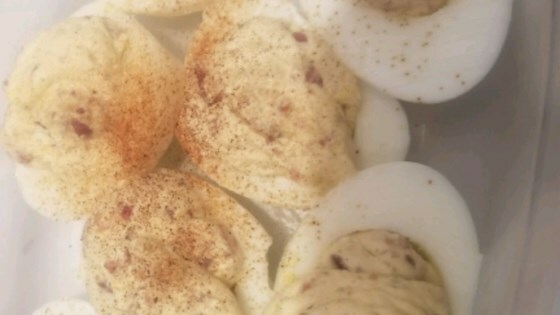 "These are creamy deviled eggs with an edge that go well with BBQ chicken on the grill and macaroni salad. You can use piping tips to create a beautiful filling design." Spoon egg yolks into a bowl. Add cream cheese, mayonnaise, and garlic powder; mix well. Fold 3 crumbled slices of bacon and jalapeno pepper into egg yolk mixture; season with salt and pepper. Fill each egg white half with egg yolk filling. Sprinkle remaining crumbled bacon over filling and top with paprika. Chill in refrigerator for about 1 hour before serving. I use the store-bought jar of whole jalapeno peppers. When mixing, I use a little of the juice from the jar of the jalapenos in the egg yolk mixture to make it smooth and creamy. I have also on occasion used Hormel® Real Bacon Bits rather than cooking bacon to save time. I made these for a BBQ. Everyone loved them. I had to add a little more seasoning but they were amazing! Exceptionally creamy and a big hit. Added both chopped up red and green Jalapeño peppers to give it a Christmas look. It was a trial run for me but definitely will be repeating it soon!